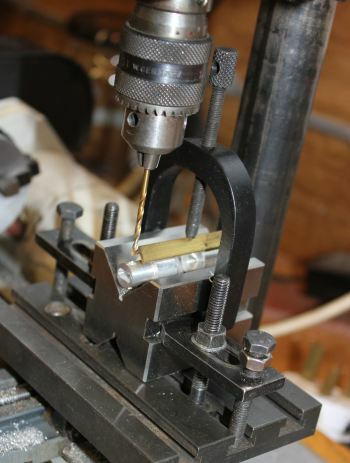 Using a V-block to clamp the piston of my rotary engine to drill the gudgeon pin hole. As there were 5 pistons (5 Cylinder Rotary Engine) to drill exactly the same I set up the V-block and clamped it to the milling table. 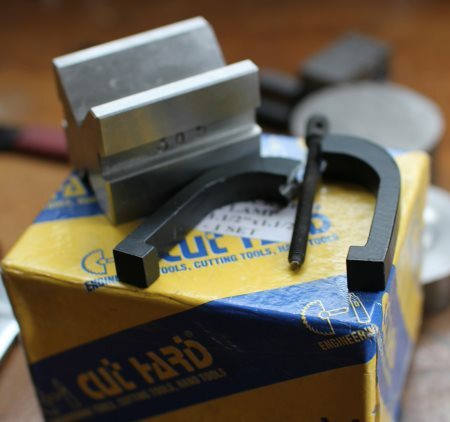 The V-block clamp is quite large and would have hit the chuck so I used another piece of bar-stock and a piece of brass angle to apply the clamping force, thus allowing the clamp to be moved away from the line of the chuck. You won’t need a pair of V-blocks that often, but when you do need them nothing else will do, therefore, something you need to keep in the bottom drawer. Preferably wrapped up in oiled paper to stop them going rusty. These are a cheap pair of V-blocks as you can see from the next picture. The clamps cannot take much of a load, I needed to hold something secure to mill a slot and so put a small bar through the hole in the knurled bolt and tightened it up. There was a sudden crack and the yoke had broken into 2 parts. Looking at the material it is of a low quality and they appear as if they have been cast. Maybe not such a great buy. The trouble is I needed to clamp the part I was working on and so tried the other clamp and once again it broke and in the same place. So for £20 these were cheap, but probably worth looking for some better quality secondhand V-blocks. 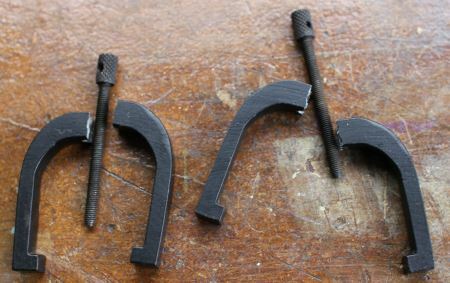 The image of the 2 parts broken in exactly the same place, what appear to be rubbish castings. The blocks are quite good, maybe I should make some better quality yokes, will update the post. 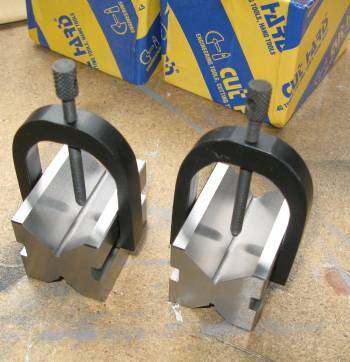 There are a number of different ways to hold or clamp a workpiece – see our page on workholding.